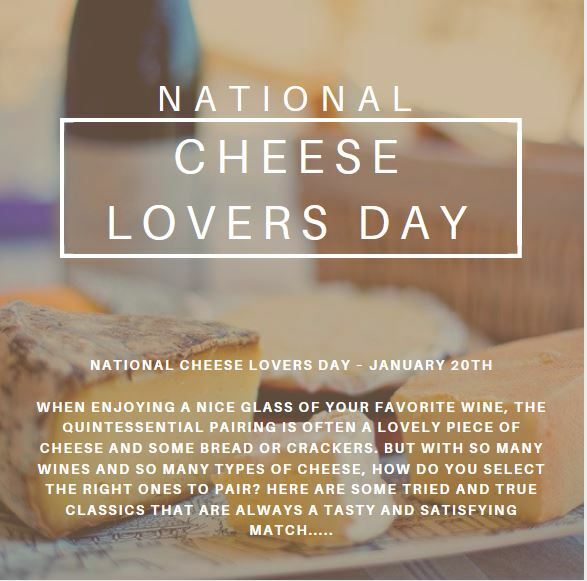 When enjoying a nice glass of your favorite wine, the quintessential pairing is often a lovely piece of cheese and some bread or crackers. But with so many wines and so many types of cheese, how do you select the right ones to pair? Here are some tried and true classics that are always a tasty and satisfying match. Chèvre (soft goat cheese) – Goat cheese is smooth and creamy in texture with very fine grained mouth feel. Its tart finish with notes of herbs and grass are an excellent match with similarly flavored wines such as French Sancerre, Californian Sauvignon Blanc, Alsatian or North American Pinot Gris, and dry Provencal Roses. Smoked Gouda – Smoked Gouda is a firm cheese, creamy in texture, with a subtle to overt smoky flavor, depending on the level of smoking. This cheese is incredibly creamy with a more delicate, less sharp flavor than cheddar. This cheese pairs well with wines with a bold smoky element or rich tannins to cut the creamy fattiness of the cheese. Candidates for interesting pairings are Oaked Chardonnay, Syrah, Cabernet Sauvignon, and Carmenere. Blue Cheese – Blue cheese can come in a variety of forms and consistencies; from the firmer, marbled, and pungent Stilton, to the softer, salty, and creamier Gorgonzola. Most folks have a love/hate relationship with blue cheeses due to its pungent, tart, earthy, and cultured flavors. If you fall into the enthusiast camp, some superb pairings include Chablis, dry Riesling, Petite Syrah, and dessert wines such as Sauternes and Ports. Parmesan – More than a mere pasta topping, parmesan is a hard cheese with an exterior rind made of cow’s milk. It can encompass a myriad of flavors, largely due to the feed of the contributing cows. Flavors include a mild grassy character, fruitiness, nuttiness, and a bit of sharp character. Excellent pairings with parmesan are Chianti Classico, Zinfandel, Sherries, and red wine blends. Cheddar – An American classic, Cheddar has become one of the most popular varieties of cheese in the US. Cheddar can come in either white or yellow colors; subtle differences made by the feed of the cows and the major color difference made by the addition of annatto coloring pigmentation. Cheddar is a firm cheese, salty, savory and sharp in flavor. Cheddar can be aged to increase this sharpness, creating a more firm yet brittle texture. Cheddar pairs well with bold and fruity reds such as Tempranillo, Merlot, Syrah, and Grenache. Brie – Brie is soft to semi soft cheese, typically formed into wheels and aged, forming a bloomy rind that is rich in flavor and that will encompass the softer interior. Made from unpasteurized cow’s milk, brie can encompass many interesting flavors from both the diet of the cow and the bloom which creates the rind. The microorganisms in the bloom can generate buttery, briny, or grassy characters. Gewürztraminer’s complex floral, herbal and grassy notes are a complex and wonderful pairing with brie cheese along with dry roses, Rkatsiteli, Pinot Grigio, and Vermentino. Mozzarella – It may be difficult to find a person who doesn’t enjoy the creamy, mild and soft mozzarella cheese. This cheese can come in a variety of forms: from firm mozzarella that can be shredded or smoked, to the soft fresh mozzarella so many of us enjoy with fresh tomatoes in the summer. Mozzarella is very smooth and creamy, subtle soft nutty and grassy flavors, and a wonderful ability to melt into a cheesy net of delicious flavor. Often seen as a staple ingredient of Italian cuisine, it is only natural to pair this popular cheese with Italian wines. When enjoying the mozzarella on its own, try it with crisp Pinot Grigio, Verdicchio, or Tocai Fruiliano. If enjoying mozzarella as an ingredient in a traditional Italian dish such as caprese salad, eggplant parmesan, or in lasagna, pair with a fruit forward and tannic red such as Sangiovese based blends or Cabernet Franc. So my wine is done fermenting, when do I rack it? After fermentation, the next immediate step is to remove the new wine from its lees, which is the sediment left behind after fermentation. The lees contain dead yeast cells, grape particulates, and maybe even a few fruit flies that could lead to the development of some unpleasant aromas in the wine if not removed. Hydrogen sulfide can be produced from the lees if left in with the new wine. The first racking should be done within a week after fermentation is complete, the sooner the better. 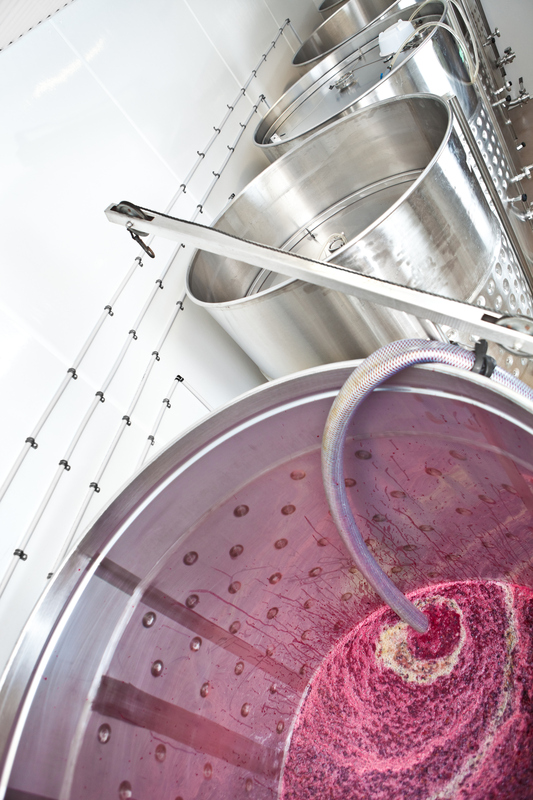 The wine should be racked into a sanitized container, with the wine filling the vessel completely, leaving a very little amount of headspace. In a carboy, the wine should go up to the neck of the carboy. After the first racking, the wine should be stored in a cool place. If the wine has been inoculated with Malo-lactic cultures, secondary fermentation will continue after the racking as the bacteria will travel over with the new wine into the new vessel. 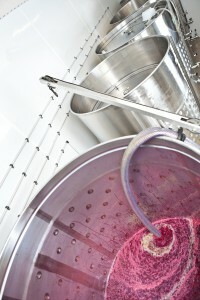 If the wine is going through MLF, do not add sulfites until this fermentation has been completed. If the wine is not going through MLF, then add a ¼ tsp of potassium metabisulfite per 5 gallons of wine to help preserve the wine. 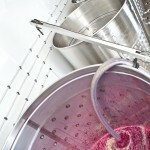 Rack every two months to continue clarifying and purifying the wine. Be sure to add sulfites each time that you rack.